Achieve aesthetic bliss when you secure your iPod, Walkman or compatible MP3 player inside the built-in Tune Tray compartment. Admire the way the attractive flip down face immediately eliminates unsightly wires and waste less time worrying about the elements with the UV resistant coating and coated circuit board. 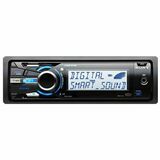 In addition to HD Radio and satellite radio capabilities, enjoy playing CDs on the DSX-MS60 Xplod Marine CD Receiver, offering MP3 and WMA playback support.